Do you need extra help for EL students? Try the Area Models and Mixed Numbers pre-lesson. Students will be able to use an area model to solve multiplication problems with mixed numbers. Review area models with whole numbers by showing students an example (see related media). Explain, "Today we are going to use area models to multiply a mixed number times a whole number." Remind students that a mixed number is a number that has a whole number and a fraction, like 5½. Provide definitions in their L1 or L2 for the following words: "area model," "mixed number," "whole number," "multiply," "fraction," "area," etc. Have a student restate the objective for today's lesson. Write a mixed number multiplication problem on board (i.e., 3¼ x 2). Decompose the mixed number (3 + ¼). Draw a rectangle on the board. 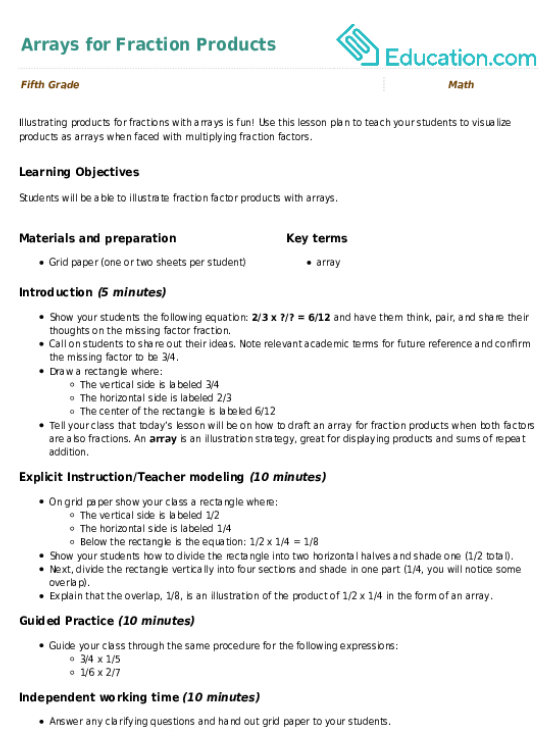 Label the short side with a 2. Draw a line to divide the long side of the rectangle into two parts. Write 3 and ¼ over the two divided parts so that you have a rectangle that has an area of 2 x 3 and one with an area of 2 x ¼. 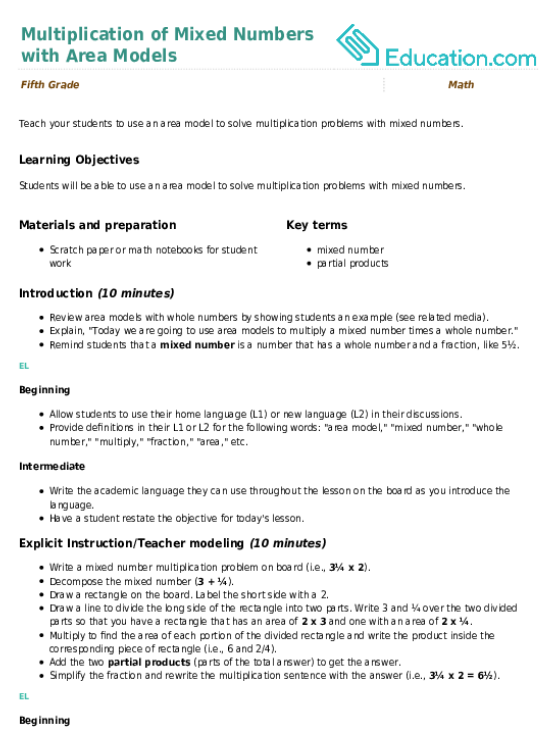 Multiply to find the area of each portion of the divided rectangle and write the product inside the corresponding piece of rectangle (i.e., 6 and 2/4). Add the two partial products (parts of the total answer) to get the answer. Simplify the fraction and rewrite the multiplication sentence with the answer (i.e., 3¼ x 2 = 6½). Give students vocabulary cards and allow them to draw visuals for the new terms. Provide them reference materials in their L1 to look up new terms. Define partial products in their L1 and L2. Tell students to copy teacher markings on their whiteboards. Have them state the areas for the two rectangles in their own words. Guide students through another example (i.e., 15 x 4½) Remember to decompose two-digit whole numbers and draw additional sections in the area model as needed. Give students a problem to try with a partner (i.e., 13 x 5⅙). 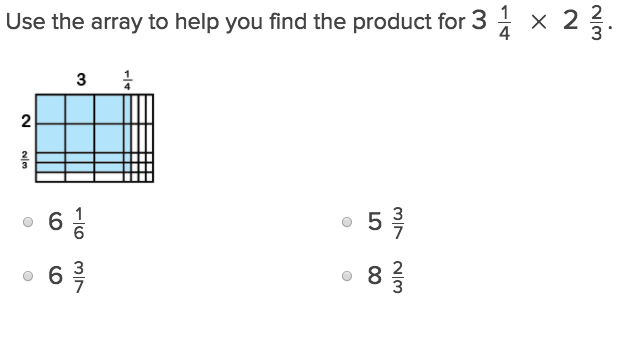 Give students a "try it" problem to solve independently (i.e., 1⅔ x 6). Circulate and offer support as needed. Then go over the problem as a class. Tell them to explain each step they make to solve the multuplication problem, using their L1 or L2. Tell students to state the steps they used to complete the multiplication problem in their L2, using sentence stems such as, "First, I..." and "Then, I...". Encourage them to use the vocabulary cards for assistance in their peer discussions. Hand out scratch paper or have students work in math notebooks. Write three mixed number times whole number problems on the board and instruct students to solve them independently, using area models (i.e., 7 x 2⅘, 6¾ x 19, 25 x 3⅛). Provide context for the multiplication of a mixed number by a whole number. For example, use a word problem like, "The dolphins at the Monterey Aquarium are fed 1/3 of a bucket of fish each day. The sea otters are fed 2 times as much fish as the dolphins. How many buckets of fish are the sea otters fed each day?" Draw visuals to help students picture the relationship depicted in the word problems. Have students tell a partner how they solved one of the problems. Ask students to think of a word problem that can represent one of the multiplication problems. Provide additional examples before assigning independent work. For independent work, assign problems with unit fractions or single digit whole numbers. Assign challenge problems with a fraction times a mixed number and have students try the same strategy to solve (i.e., 5¾ x ½). Hand out a piece of scratch paper to each student. Write a multiplication problem on the board (i.e., 3⅛ x 9). Have students solve using an area model. Collect student work as an exit ticket and check for understanding. Have students work in a teacher-led group so that they can tell the teacher how they solved the problem and the teacher can offer feedback. Challenge them to use sequencing words and new vocabulary to explain their process for solving the problem. Ask and discuss, "How can this strategy help us understand fractions and multiplication?" Rephrase the question: "How does using an area model help us understand fractions and multiplication?" Allow students to share their explanations with their partners in their L1 or L2 before sharing with the whole class. Have students discuss the question in partners and rephrase their partner's answer, using new vocabulary and sequencing words from the lesson. Multiplying mixed numbers and whole numbers: it looks rather complicated, but it's actually a matter of learning just a few steps. 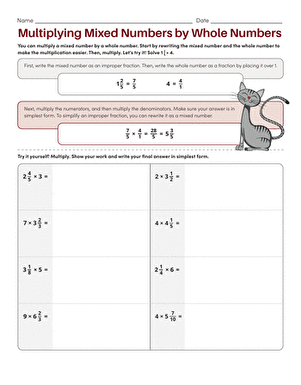 This valuable worksheet teaches your little mathematician how to convert mixed numbers to fractions, and then multiply them. 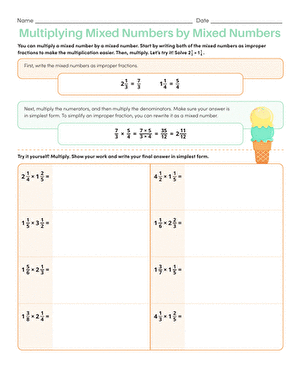 This colorful worksheet shows your child how to multiply a mixed number with a fraction, and gives him practice with the method. Learn how to convert mixed fractions to improper fractions in this worksheet. Multiplying Mixed Number Fractions and Arrays will help students practice this key fifth grade skill. Try our free exercises to build knowledge and confidence. Illustrating products for fractions with arrays is fun! 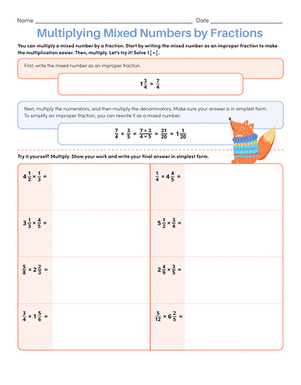 Use this lesson plan to teach your students to visualize products as arrays when faced with multiplying fraction factors.